The Cuatro is a four string distant cousin of the guitar which has evolved in the regions of Colombia and Venezuela. 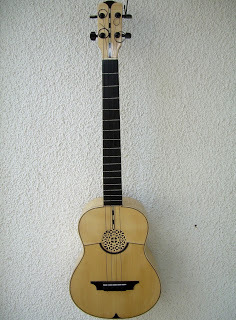 There are many relatives of the Cuatro as several string instruments have changed from the first guitars brought by the conquistadores in the 14th century. We will mention some more information about related instruments (Ukulele, Banjo, Cuatro Mandolin, etc.) in future modules. The uniqueness of the Cuatro is found within its ability to be a percussion and string instrument at the same time. Cuatro players (Cuatristas) use different strumming techniques to give the effect of a percussion accompanying the music. Apart from the strumming, the wood around the Cuatro, specifically the fingerboard found between the sound hole and the fretboard. This part of the Cuatro is used so much; it is reinforced with an additional layer of wood, typically a different kind which is noticeable as a signature feature of the Cuatro. The Cuatro forms part of the primary instruments used to play folklore music from Colombia & Venezuela. In recent times the potential of the instrument has been revolutionized by modern artists and is spreading across the globe. The legacy of the Cuatro remains in Venezuela and Colombia as the most popular instrument among all ages, and its particularities are becoming more known on an international level. TuCuatro will assist you with learning how to play all versions of music touched by the Cuatro.